Tucked away in vibrant South Austin (see South Austin homes for sale) is the beautiful master-planned community of Bauerle Ranch. With all homes built after 2002, this neighborhood is beloved for one and two-story, well-built, three-sided masonry homes, fine landscaping, hill country views, lamplit streets, and wide, winding sidewalks. Contact us directly if you have any questions about selling or purchasing a home in Bauerle Ranch. Constructed between 2002 and 2008, the beautiful homes of Bauerle Ranch are appreciated for hill country views, pedestrian-friendly streets, and modern amenities. Yet Bauerle Ranch is known for more than its beauty. It is also appreciated for affordability, being one of the lowest priced master-planned D.R. Horton communities in the area. Within Bauerle Ranch, two-story masonry/hardiplank homes stand alongside one-story, three-sided masonry models, with homes having anywhere from 3-5 bedrooms and 2-4 bathrooms. Inside, potential buyers find crown molding, double vanities, garden tubs, modern kitchens, and game rooms. Many of the homes have upgrades such as granite counter tops, stainless steel appliances, hard tile flooring, and designer colors. Outside, buyers find large privacy-fenced backyards, covered patios, and greenbelt views. The native stone exteriors of Bauerle Ranch homes blend seamlessly into the natural Texas landscape. To keep the subdivision safe and discourage unwanted traffic, a roundabout was added to the north entrance of neighborhood, and the winding streets, bright street lamps, grassy common areas, and wide sidewalks give the subdivision a peaceful atmosphere. Bauerle Ranch has an active HOA, and membership in mandatory. As of 2012, the dues were approximately $30/month. The HOA maintains the common area, the community pool, and the walking trails. The City of Austin provides electric, trash, and water services, and Texas Gas Service provides natural gas. The Austin (see Austin homes for sale) subdivision of Bauerle Ranch is located in zip code 78748 (see 78748 homes for sale). It lies a quarter-mile south of W. Slaughter Lane and a quarter-mile west of Manchaca Blvd. in the MLS Map Location area SWE. The neighborhood can be accessed from the east via Old Manchaca Rd. and from the north via Lindshire Ln. Bauerle Ranch is bordered by Ford Oaks neighborhood and Manchaca Rd. to the east, Elmwood Park neighborhood and Slaughter Lane to the north, Brodie Spring neighborhood and Brodie Lane to the west, and Hillcrest neighborhood to the south. The main entrance lies to the north on Lindshire lane, while the main thoroughfare is Lynnbrook Dr. 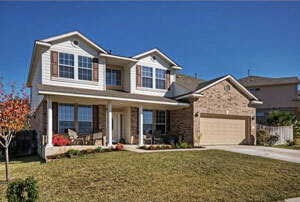 Proximity to IH-35 and Mo-Pac (aka Loop 1) makes Bauerle Ranch ideal for commuters. The commute to downtown Austin from Bauerle Ranch is 13 miles and takes approximately 15 minutes, or 25 in traffic. It is about 20 minutes from the airport. Residents of Bauerle Ranch enjoy a number of nearby parks, as well as access to exclusive amenities, including beautiful Bauerle Ranch Park, a half basketball court, community bathhouse, and swim center. The large, fenced-in pool has a tapered end for toddlers, a raining mushroom water feature for kids, and is resident-restricted. The swim center also includes a covered playscape and picnic facilities. All facilities are protected 24-hrs a day by security cameras. For those who enjoy golf, the Onion Creek Club is three miles away. This 27-hole course, known as the “Birthplace of the Senior PGA Tour,” was founded by three-time Masters Champion Jimmy Demaret. Residents can join the club as Golf Members or Tennis Members. Each will provide access to the respective sport, as well as the club’s fitness center, Junior Olympic-sized pool, baby pool, and six outdoor lighted tennis courts. Bauerle Ranch Park (in subdivision) - This oak-shaded, dog-friendly, 319-acre park, also known as the Slaughter Creek Greenbelt, has 3.1 miles of hiking trails winding through a natural Texas landscape. It can be accessed from multiple trailheads throughout the neighborhood. The Veloway Trail (2.2 miles NW) - Austin’s first non-pedestrian trail exclusively for bicycles and rollerblading, the Veloway is a 3.1-mile paved asphalt loop located on more than 100 acres of scenic preserve in the Slaughter Creek Metropolitan Park. It is 23 feet wide, and can be accessed from Loop 1 Mo-Pac (about a mile south of Slaughter Lane) or from Bowie High School on Slaughter Rd. during non-school hours. Lady Bird Johnson Wildflower Center (2.2 miles NW) is two miles away and is a great spot to visit, with 16 themed gardens including a butterfly garden and children’s garden. Bauerle Ranch is located within minutes of fine restaurants and several shopping complexes, each with a wide selection of stores. The closest are listed below. Southpark Meadows (3.1 miles E) includes over 90 stores, services, restaurants and entertainment options, including Cinemark Theatres, Hobby Lobby, JCPenney, Circuit City, Bed Bath & Beyond, Target, OfficeMax, Hobby Lobby, Wal-Mart, Ashley Furniture, AT&T, Sam’s Club, Bath & Body Works, Starbucks, Jo-Ann Fabrics and Crafts, Mattress Firm, FedEx and much, much more. The oak-shaded central park is a popular place for visitors to enjoy good food, special events, and live music, let the kids play on the large playscape, or cool off in the interactive water fountain. Tanglewood Village (1.1 miles N) is located northwest of the intersection of Slaughter and Manchaca Rd. Stores include HEB grocery, Tuesday Morning, RadioShack, and Blockbuster Video. Plaza at Slaughter Creek (.5 mile NE) - Just north of Bauerle Ranch, this popular center has a Jumpy Gym, a Planet Fitness gym, Thundercloud Subs, D’Ette & Co. dance company, a fresh-squeezed juice and smoothie shop, and an Austin Regional Clinic location. The Shops at Arbor Trails (3.5 miles N) is a brand new shopping center close-by at William Cannon and Mo-Pac. The site contains a Whole Foods Market, as well as a Costco, Staples, and dozens of popular small shops and restaurants. It also has a forested, gravel-covered walking trail and a beautiful new playground. From fine dining to casual, the Bauerle Ranch area abounds with nearby restaurants. Here are a few favorites: TGI Friday’s, Chili’s Bar & Grill, Mama Fu’s Asian House, Café 1626, Texican Café, Waterloo Icehouse, Third Base Sports Bar, Haiku Sushi, Little Woodrow's LongHorn Steakhouse, Carino's Italian Restaurant, Amy's Ice Cream, DoubleDave's Pizzaworks, P.Terry’s Burgers, Kerbey Lane Café, Galaxy Café, Satellite Bistro & Bar, and Texas Roadhouse. Residents of Bauerle Ranch enjoy proximity to a number of local grocery stores. Bauerle Ranch homes are in the Austin Independent School District (see Austin ISD homes for sale). Parents and potential homeowners should always check with AISD for current schools for the Bauerle Ranch subdivision.